Abi Allanson, organiser of the event, was presented with a Certificate of Achievement. Children from a school in Kings Langley grabbed their books to take part in a readathon to raise thousands of pounds for charities dedicated to caring for seriously ill children. 150 children took part in the national Readathon Challenge at The Rudolf Steiner School to raise £3,099 for CLIC Sargent, Roald Dahl’s Marvellous Children’s Charity and ReadWell. Abi Allanson, the learning support teacher who organised the event, was presented with a Certificate of Achievement and received a voucher for £619.72 to spend on books for the school. 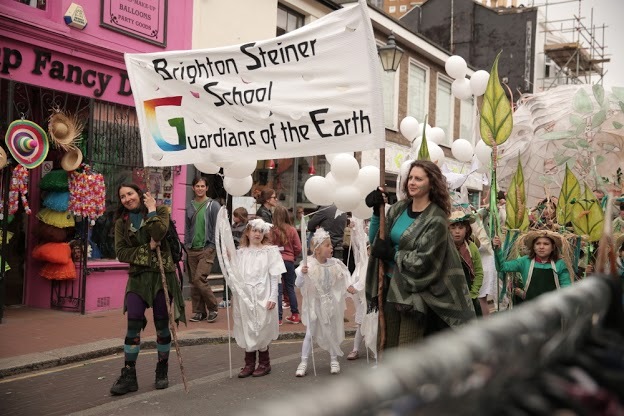 Brighton Steiner School joined almost 80 other local schools for the annual Children's Parade through the streets of Brighton to mark the beginning of the May Festival. 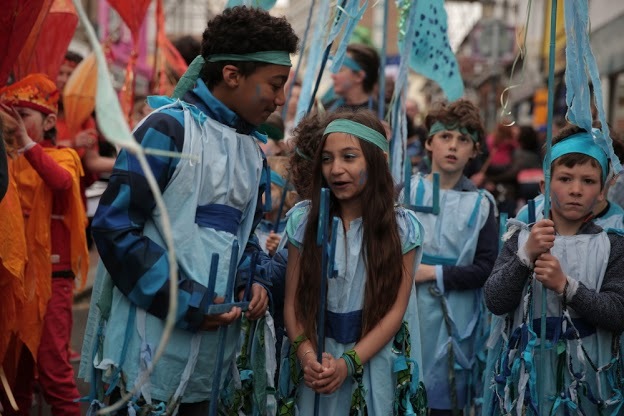 The children enjoyed a real sense of pride as their hard work turned into a vibrant procession of dance, drama and fun for the whole city to watch. 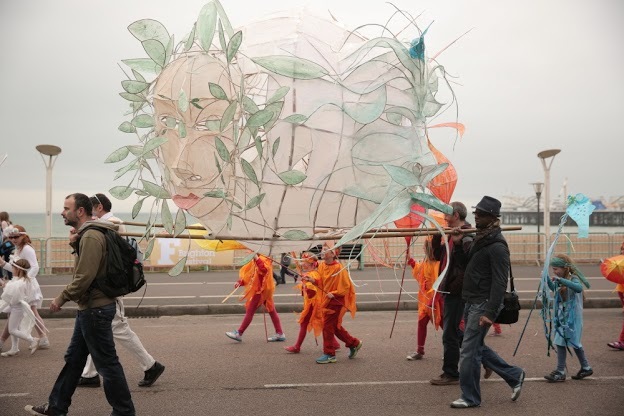 Around 10,000 people came along to see the parade and be part of the largest annual children’s event in the UK. Earlier this year we entered some national awards for the first time. Many of you might think it is perfectly natural to put our school forward for awards. Others might question the decision, thinking that awards are not very ‘Steiner’. However, the reason we decided to enter this year is quite simple: outside of the ‘Steiner-Waldorf’ world, most people do not yet recognize how good the teaching is in Steiner-Waldorf schools. We want to change that, raise our profile and adopt a more evangelical approach to Waldorf education. We entered this award on the basis of the Upper School’s innovative and creative Waldorf curriculum and their ability to secure the best GCSE results in Stourbridge, despite allocating over a third of the timetable to creative, enriching experiences that are utterly unrelated to GCSEs! In 2010 we re-organised the entire upper school curriculum to create morning modules. Students in the Upper School can choose from a range of three week modules which run all year round, for 1 hour 30 minutes every day. Modules are derived from body-based learning and aim to inspire and awaken the mind and body for the day. A total of 37 modules are offered, including: folk music performance, choreography, stained glass, bow-making, Shakespearean acting and half-marathon training. As far as we know, we’re the only school in the country to offer this. The award judges were blown away by morning modules and were supremely impressed with main lessons, where they observed outstanding teaching, a love of learning and confident, creative students. Over 24,000 entries were received for the National Teaching Awards. Being Runner Up is a credit to our curriculum, to the upper school teachers delivering the curriculum and to all teachers in other areas of the school who prepare our pupils so that they can learn in this way. Avril felt uncomfortable in being singled out for this award as she considers herself to be part of a team that works together to deliver a wonderful curriculum. In truth we could have entered many other teachers. It was on the understanding that she would be representing Elmfield’s education and Elmfield’s teachers that she agreed. Our entry was based on the methods used by our teachers at Elmfield – such as the use of movement, music, inspiring main lessons and all the learning styles to stimulate curiosity and a love of learning. On May 17th the Times Educational Supplement announced that Avril is one of only six teachers in Britain to be shortlisted for this award. She’ll be going to a ceremony in London on 5th July with government ministers, the national press and 600 guests, where the final result is announced. Having one of Elmfield’s teachers at this event is an amazing achievement for the school and Steiner Waldorf education generally. YOUNGSTERS at York Steiner School, in Fulford, took part in a Scottish-themed fancy-dress day. The children and teachers came dressed in tartan and there was even a Loch Ness monster. The York Steiner School is part of a network of 34 Steiner schools in the UK and the fun Scottish day was to help raise funds for the Glasgow Steiner School, which recently suffered from a devastating fire. Meanwhile, the school is inviting members of the public along to its annual spring fair on Saturday. The event, at the school in Danesmead, will feature a fairy grotto, crafts, puppet show, Maypole dancing and food and drink. It will run from 11am to 4pm.